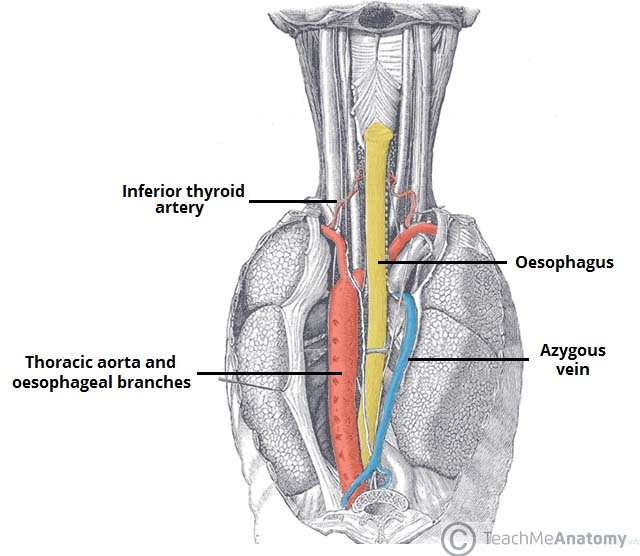 Oesophageal tears are ruptures to any part of oesophageal wall. Although rare, full ruptures have a mortality of between 50 – 80% so early recognition and treatment is essential. There is a wide spectrum in the severity of oesophageal tears, the main two subcategories being superficial mucosal tears (Mallory-Weiss tears) and full thickness ruptures. Oesophageal perforation is a full thickness rupture of the oesophageal wall; if it is spontaneous (often due to vomiting), it is often called Boerhaave’s syndrome. Perforation will result in leakage of stomach contents into the mediastinum and pleural cavity, which triggers a severe inflammatory response which will rapidly become overwhelming, resulting in a physiological collapse, multi-organ failure, and death. Rapid identification and management is therefore essential. Oesophageal rupture is a surgical emergency and patients deteriorate rapidly, rapid identification and management is therefore essential. The two most common causes are iatrogenic (such as endoscopy) or after severe forceful vomiting. The most common site of perforation is just above the diaphragm in the left postero-lateral position, although it can occur elsewhere in the oesophagus. 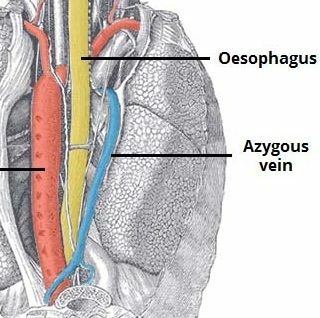 They are rare, with an incidence of 3.1 per million per year and most cases occur in patients with an otherwise normal oesophagus. The classic picture* is of a patient who presents with severe sudden-onset retrosternal chest pain, respiratory distress, and subcutaneous emphysema following severe vomiting or retching. *Note that often subcutaneous emphysema is frequently absent and the full combination of vomiting, chest pain and subcutaneous emphysema (Mackler’s triad) is only seen in around 15% of patients. Initial imaging via a CXR may demonstrate evidence of pneumomediastinum; intra-thoracic air-fluid levels may also be seen. Do not delay definitive imaging while awaiting the X-ray, as it often adds little to management. The investigation of choice is an urgent CT chest abdomen pelvis with IV and oral contrast* (Fig. 2). This may show air or fluid in the mediastinum and pleural cavity; leakage of oral contrast from the oesophagus into the mediastinum or chest is pathognomonic. *CT imaging can miss small leaks and has a sensitivity of ~85%. If there is a high level of clinical suspicion (based on the history and examination), the patient should have an urgent endoscopy in theatre. These patients are often septic and haemodynamically unstable. Urgent and aggressive resuscitation is therefore essential. Ensure high flow oxygen, IV access, fluid resuscitation and broad spectrum antibiotics are given immediately. Definitive management varies depending on whether the perforation was spontaneous or iatrogenic and on the age and comorbidity of the patient. The majority of patients with a spontaneous perforation will need immediate surgery to control the leak and wash out of the chest. This is almost always via a thoracotomy. Patients also need an on-table OGD to determine the site of perforation and therefore the site of the incision. Leakage is common and the patients should have a CT scan with contrast at 10-14 days before starting oral intake. They may therefore warrant a feeding jejunostomy to be inserted at the time of surgery for nutrition. A variety of techniques can be used when repair in the perforation, partly dependent on the length of time between injury and surgery. One example is using a flap from the diaphragm to buttress it and then insertion of a trans-gastric drain through the fundus of the stomach (via a laparotomy). This drain both reduces the pressure in the oesophagus (by splinting the Gastro-oesophageal junction) and drains the oesophagus. Patients with iatrogenic perforations are often more stable than those with spontaneous perforations* and may be suitable for non-operative management. Other patients potentially suitable for non-operative management include those with minimal contamination, a contained perforation, no symptoms or signs of mediastinitis, or no solid food in pleura or mediastinum. Patients with significant co-morbidities who are clinically stable with only a small perforation may be suitable for conservative management. Morbidity and mortality is high (between 50–80%) and therefore early identification and treatment will most influence outcomes. Mallory-Weiss tears are lacerations in the oesophageal mucosa, usually at the gastro-oesophageal junction. They tends to occur after a period of profuse vomiting, and in turn results in a short period of haematemesis. They account for approximately 5% of all cases of haematemesis. They are generally small and self-limiting, in the absence of clotting abnormalities or anti-coagulation drugs. Presentation with haemorrhagic shock is possible but rare. The investigation and management of Mallory-Weiss tears is the same as for any other upper GI bleed (as discussed here). Although rare, any patient presenting with hypotensive shock require urgent resuscitation, with fluid resuscitation and bloods taken, including group and save (+/- cross match as needed). Most cases can be managed conservatively, rarely warranting interventional or surgical management. The overall mortality from an oesophageal rupture is? 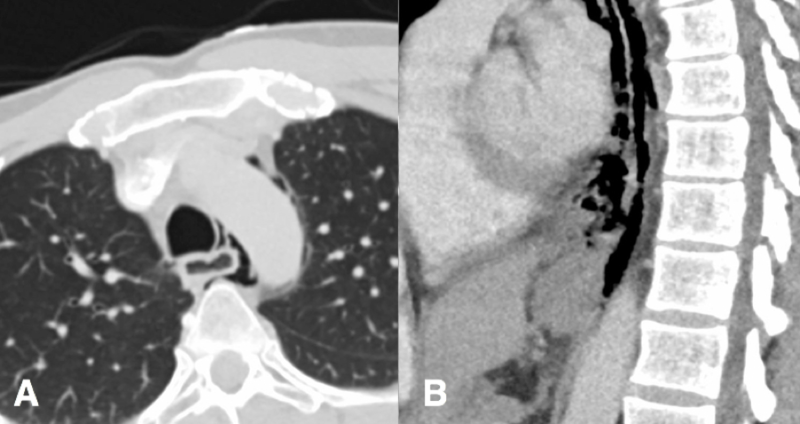 Which of these is not a common presentation of oesophageal rupture? Which of these is the most important investigation that should be performed to help make the diagnosis of oesophageal rupture? A suitable fluid regime for an otherwise well 50 year-old patient with a suspected oesophageal perforation who is tachycardic in the emergency department is?